Complications arising from payments (or lack thereof) are the most common problem that bog down members of the freelance community. Without an upfront payment strategy, a client could potentially leave you with a hand full of bills and no financial relief in sight. For this reason, it is critical that you establish a plan to secure payment upfront. Like any other profession, freelance work comes with both benefits and drawbacks. If you work out a good strategy for approaching and handling clients in a professional manner that works well for both parties, freelancing can be a dream come true. On the other hand, however, if you do not work out an effective strategy it can truly be a nightmare. There are a variety of factors that can affect a client’s pay schedule, whether it be their own payday, the speed at which a project is completed, or the consistency of communication between both parties. Once a client has the completed work that they have commissioned, however, there is no longer any incentive for the client to pay in a timely manner, if at all. Clients lose interest in contracts, find cheaper labor, or get busy with other business or life matters. This is why it is so important to work out how to ask for upfront payments that will save you from potential conflicts and delays of income. But, what is an upfront payment? An upfront payment is a method of transaction in which a client pays for part, or sometimes all, of a project or commission before it is completed. Think of it as a deposit. Most freelancers don’t require a full upfront payment, as that tends to dissuade clients from approaching them, but some form of upfront payment can be greatly beneficial to both parties. What are the benefits of being paid upfront? Being paid upfront is one of the easiest ways to instill trust between a client and a freelancer. It gives the freelancer some income at the start and gives them something of a guarantee that upon completion, the rest of the payment will be delivered. It allows them as well to be able to hold a project until payment is completed and assures them that the client is serious about the contract and intends to fully see it through. On the client’s side, paying a bit upfront may seem a bit sketchy, but it does give them reassurance that the freelancer will begin the work and will complete the project to the best of his or her ability to ensure that they receive the remaining portion of the overall payment. Great for keeping your cash flow: Especially important in long-term projects. Gives you the safety: Don’t waste time in thinking of getting played and focus on delivering the best work possible. Liquidity for project expenses:If you need any special tool or program to complete the project you can pay it from the deposit. We live in the age of information. As a professional freelancer, this means that you absolutely must be your very own PR agent. When a client does their homework and researches your background prior to hire, you want them to see you as a reliable, intelligent professional. You do not want them to find nothing but embarrassing photos, memes, or emotional outbursts that you’ve expressed on social media in the past. Clean up your social media accounts, update your portfolio, and make sure that you have great testimonials, reviews, and recommendations to share with potential clients alongside your work. People are typically more comfortable if they know exactly what they are getting for what they pay, and it’s a relief for the freelancer, as well. My mind is most at ease when I go into a project already knowing the exact compensation that I will receive, and my clients appreciate knowing how much their project will set them back before I get started. Doing things this way reassures clients that you have a realistic idea of the time, resources, money, and research that will go into the project. It helps you determine exactly what the job is worth ahead of time so that you don’t end up feeling like you got the short end of the stick. To the client, it also means that you won’t up and change your price to at the last minute. The vast majority of professionals that you will work with will be willing to either work out a percentage-based deposit, or a milestone-based payment schedule. Using these types of agreements are beneficial to both parties. It provides the client with reasonable security that you will complete the job for the remaining portion of the payment. It reassures you the freelancer that the client is serious about the contract and truly has the means and intention of paying. Deposit payments are very common in the arts fields, e.g. commissioned art, tattooing, etc. This method involves the client paying a deposit – usually 25-50% - upfront, with the remainder to be paid at the project’s completion. It requires a client to be serious and guarantee payment, as well as give a freelancer money ahead of time in case extra materials need to be purchased to complete the project in question. This is one of the most common methods of payment, and in turn will likely be most amicable to clients, as it the method with which they are most familiar. Milestone pay is incremental payments at different portions of a project. These are usually ideal for long-term projects that will span over the course of multiple months. A freelancer will get paid every __ weeks or days, etc., or it is done by milestones in terms of completion of the project, e.g. when a certain task is complete. The trick with this method is to ensure that the payments are on your schedule, not the client’s. What often happens is freelancers will get caught up in the client review process and, if they aren’t getting paid until the piece being reviewed is complete, that can lead to weeks-long delays. Make sure the pay dates are set, agreed on, and followed. 100% upfront payments are usually the ideal scenario for freelancers. All the money is gained at once, the client can’t suddenly duck out on them, and clients won’t have to worry about last-minute, emergency costs. However, they come with stipulations. As a freelancer, you cannot do more work than the contract entails. If you finish a project and present it to a client, great! You’re done! But if they come back and ask you to make some changes or add content to things not in the original contract, you may end up working for free. If this happens, kindly offer them another opportunity to pay, whether it be upfront or hourly. Sometimes clients want more than they originally asked for, and just because you paid upfront doesn’t mean you have to give extra labor without pay. If you were presented with the opportunity to pay either $90 or $100 for your groceries, which would you choose? Obviously, you would choose the lower amount, as it is a better deal. While this system wouldn’t work in a grocery store, it does work in the freelance world. Decide how much you want to charge per project, per hour/week/month, or per word before approaching a client about a job. Then add 10-25% to the original number that you came up with, depending on what seems appropriate and reasonable. When you pitch to your potential client, lead with the inflated price, but offer them a discount of 10-25% if they pay upfront in full. If you lack the confidence to request the entire payment upfront, take baby steps. Start offering a similar percentage-based discount if clients pay 30% or 50% upfront. You want to learn how to ask for upfront payment. Well, unless you start asking clients for upfront payment, you’ll never get it. It is just that simple. You don’t usually enter into a negotiation by offering to just givethe other party your money prior to coming to some sort of agreement, and your client isn’t going to do this either. If you are uncomfortable asking your client about upfront payment, you can avoid this part of the negotiation and haggling completely with just a few sentences of good, preemptive ruling in your paperwork. Do not make the mistake of waiting until you are in the negotiation phase of hiring to bring it up. Construct a short, simple, and sweet preamble to your contract that explains what you are charging for upfront, and any relevant discounts or other incentives that you offer in exchange. It can be hard to figure out how to politely ask for upfront payment. 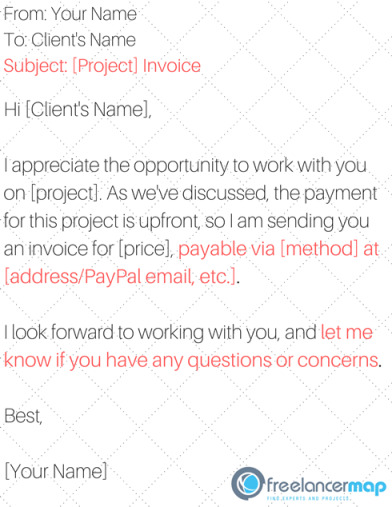 To help, we’ve provided something of a script; of course, it must be modified for your particular situation, but feel free to use this template to form the skeleton of your email! Applying these tips and tricks to your freelance career will bring you a peace of mind that you may not have known was even possible. Changing the way that you handle the financial aspects of your career can be empowering and enjoyable, as well as financially beneficial. Try one (or more) of these techniques to ask for upfront payment with your next potential client and see how you do! Do you have any other tips on how to ask for upfront payment? Let us know in the comment section below! Ashley Victoria Owen is a freelance Writer who specializes in creating unique and engaging articles, blogs, and other content (the ABC’s!). By day she is an avid hobby aquarium enthusiast, blogger, crafter, dog lover & gardener. By night she is a dedicated and passionate freelance researcher and writer.